« Gee but it’s good to be back home…. Our lap top blew up so we have not been checking our mail until today. We spent a nice time in Tucson, went to the 4th Avenue Street Fair with over 400 vendor booths, live bands, and . We got Eric a power ranger cape. We spent a day at the Desert Museum which is sort of a cross between a zoo and a nature trail – it is almost all outdoors. Got there is time for an incredible show/display of Harris Hawks. 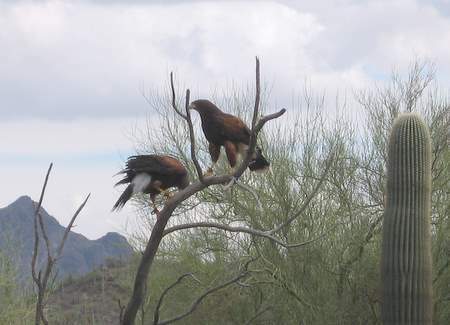 Harris Hawks are social and hunt as a group. We got to see 5 of them ‘hunting’ together. One of the better wildlife exhibits we have seen. The Hilton is quite resort-ish. Pool is very busy so did not go in, just sat by the edge the fisrt day. We had a very nice diner with the instructor/pro on Sunday night. Yesterday was all about golf. There are only three of us in the class and the instructor/pro is a very down-to-earth, jolly kind of guy who definitely thinks golf is fun and wants you to think so too. We spent 2 hours whacking at the golf ball – well, actually he was trying to teach “the fundamentals” of how to hold the club, how to stand etc. We hit the ball more often than not and was quite surprised to have some fairly good hits. We had some great hits, but a few went off course and near houses. Then we spent another hour doing “chip shots”. Those were somehow harder. We went to the club house and had a nice lunch then went on an actual golf course. It was after 3 when we got back to the room and we just watched televison and read until bedtime. Well, we are a little stiff today but think that will work itself out on the driving range this morning! Temperatures are expected to be in the 80s with serious winds today.